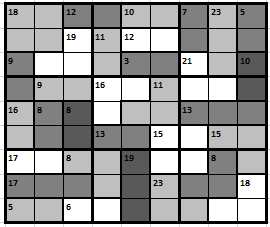 Here's a sudoku puzzle with a twist! 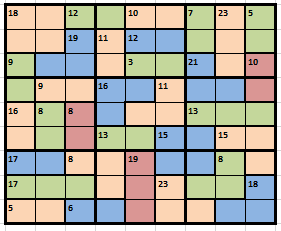 The numbers given in the squares are actually the sum of the numbers in that region. For example: 18= Sum of the numbers in the 4 yellow squares or 12= Sum of the numbers in the 2 green squares and so on. no row or column should have any digit more than once. 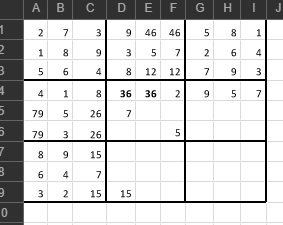 Each 3x3 box should have each digit from 1-9 exactly once. The digits in the region should add up to the number given. No number is to be repeated in a region. For example: 10=6+4 and not 5+5. I believe the rules are clear. So, go on solving it. The answer to be accepted should show most of the steps clearly(At least the first few steps, because they are a bit difficult). 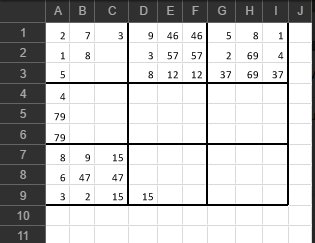 - Each line, column and 3x3 box is worth 1, 2, .. 9 = 45 points. The 17 value consists of 9 and 8. The bottom 5 and 6 pairs must be 1, 2, 3 and 5 and the 16 above the 17 consists of a 9 and 7. Let's continue with the 9 above the 16. As said, each box has 45 points, and we do know one number is left. 45 - 19 - 8 - 8 = 4. So, we can fill in both 4 and 5. We now know the 12 in the same box as well. 45 - 18 - 19 - 5 = 3. Top center box contains a 3, that has to contain of a 1 and 2. We can now already assume what numbers are in the different boxes. Continuing on the top right box. The 23 has to be a 6, 8 and 9. We can also fill in the 5 and 2, as the 5 can only be in one place. Now the 2 is taken, we know the group of 5 consists of a 1 and 4. The 3 and 7 are left and placed below the 2 and 4. With this information we can fill in most of the top left box as well. Starting with the 7 (middle top) and 2 (same row). We can now fill in the box of 18. 18 - 2 - 7 leaves 9. The only possibility of this 9 is a 1 and 8. We continue with the middle left box. The 8 can only be placed within the group consisting of 9. We fill in both 8 and 1 here. Now the 3 and 5 has to go to the left of this group of 8, while the 2 and 6 are placed right. This allows us to complete the top left box as well. I checked the middle box as well and I found out I can fill in one more free number. 45 - 16 - 11 - 13 = 5. This places the 5 on three new locations. Let's take a look at the 21 of the box right top. If I would fill in a 3, the puzzle cannot be solved, as I cannot fill in a 13. I have to add the 7 there, completing the top right box with a 3 in the 10 group. I placed a 7 below. In this row I now have left a 2, 3 and 6 which I am able to fill in the middle box. I tried putting a 2 in the group of 16 in the box, but I can't. 14 consists of 6 and 8, which is impossible to do. So the 2 goes in the box of 11. 3 and 6 makes 9, so we can add the 7 in the group of 16 as well. We are able to finish the middle box now. The 13 in the middle right box can only be a 3, 4 and 6. And, since the 3 and 4 are used in the last column, we know the exact location of the 6. I did exactly the same on the 19 in the bottom middle box. As said before, a 23 can only exist of a 6, 8 and 9. We are able to fill in the 23 in the bottom box now as the 8 must be placed in the box bottom right. With this information, we are able to add more numbers in the bottom box and in the middle right box. I assume the last part is the easiest one: bottom right box. 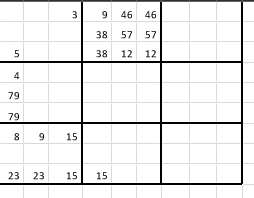 The 16 of the middle box already has a 5, 1 and 3. 6 is missing there. The group of 8 can only have a 1, 3 and 4 combination. Let's fill that in, as well as the remaining box of 18. Now we are almost done - do not forget the 3 and 4 in the middle right box! Not the answer you're looking for? 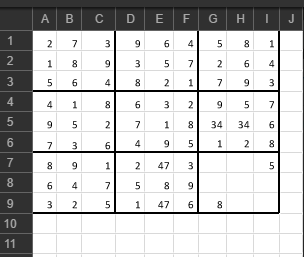 Browse other questions tagged no-computers sudoku grid-deduction or ask your own question.